In the run up to the Annual Flower and Produce Show in Capel St Mary, some of the most passionate growers around prepare their crops to see just who can grow the biggest pumpkin. Digging for Victory is the charming story of a Suffolk village allotment and the dedicated growers, enthusiasts and contenders who tend to their fruit and vegetables. 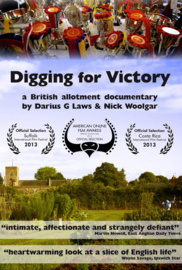 With a diverse cast of characters and a quirky yet affectionate style, this feature length documentary debut by Suffolk-born filmmakers Darius G Laws &amp;amp;amp; Nick Woolgar is a warm and nostalgic look at this most British of past-times. A feel-good film guaranteed to entertain and inspire.